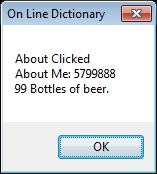 I was able to get my OLD (On Line Dictionary) OCX to do the following. About_Clicked = "Return from About click"
COM::CBN oCollection, "Add", :CALL, ADDRESS(Fetch_Clicked()), "win.btnFetch_Click"
COM::CBN oCollection, "Add", :CALL, ADDRESS(About_Clicked()), "win.btnAbout_Click"
args(2) = "Bottles of beer." I just wanted to mention I couln't be happier how well this is working even if no one else cares. I see this saving me a tons of time building modern GUI applications that are easy to create and support. Lets hope MS keeps COM/OLE automation around for awhile. I can't see COM/OLE disappearing in the near future - it is too deeply embedded into the current generation of applications. Mind you, even if it does get cut, I'm sure the Open Source community (fingers crossed here) will end up producing a COM/OLE to whatever's new bridge (driver). If Microsoft wants to keep the developers they have, taking things away isn't the way to do it. I had forgotten about the MsgBox function in the NT extension module. Much easier to use than the DYC FFI call to the Windows MessageBox API function. For those wondering if this runs on the current version of Windows 10. The author of the VBCCR (Common Controls Replacement) OCX also wrote a MSFlexGrid Replacement OCX. It supports Unicode among other enhancements. 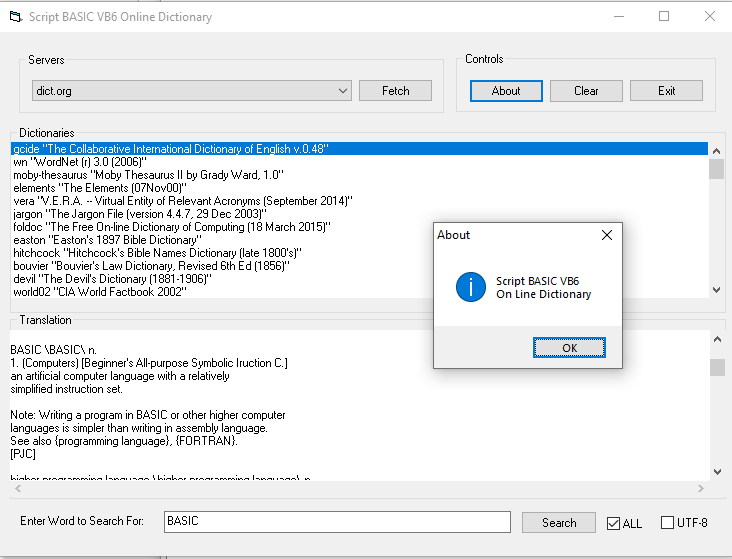 Here is the VB6 OCX version of the On Line Dictionary example. Compare it to the IUP version in post #12 of this thread. WHILE LEFT(dat, 1) <> "." 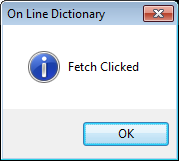 PRINT#1,"DEFINE * " & searchword & "\n"
PRINT#1,"DEFINE " & dict & " " & searchword & "\n"
IF LEFT(info, 1) <> "." THEN total &= TRIM(info) & "\r\n"
UNTIL LEFT(info, 1) = "." total = "No match found." 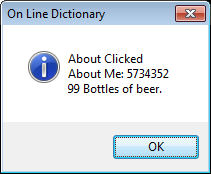 total = "Select a dictionary first!" dat = "Could not lookup word! 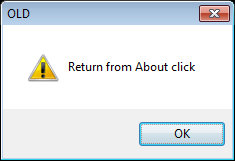 (" & ERROR & ")"
COM::CBN oCollection, "Add", :CALL, ADDRESS(btnFetch_Clicked()), "win.btnFetch_Click"
COM::CBN oCollection, "Add", :CALL, ADDRESS(btnSearch_Clicked()), "win.btnSearch_Click"
MsgBox "Script BASIC VB6" & vbCrLf & "On Line Dictionary", vbInformation, "About"
' Save the form's and controls' dimensions.
' Save the controls' positions and sizes.
' Save the form's size.
' Arrange the controls for the new size.
' Don't bother if we are minimized.
' Get the form's current scale factors.
' Cannot change height of ComboBoxes. 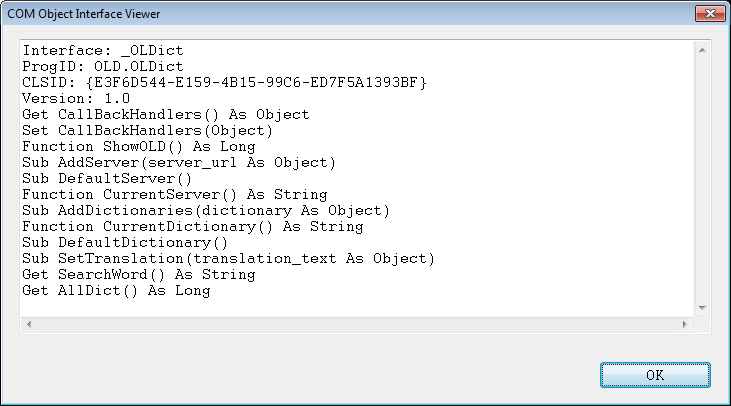 I've changed the GetALL and GetEntry methods to AllDict and SearchWord properties. The Script BASIC and VB CLASS code in the previous post has been updated with the GET property changes. 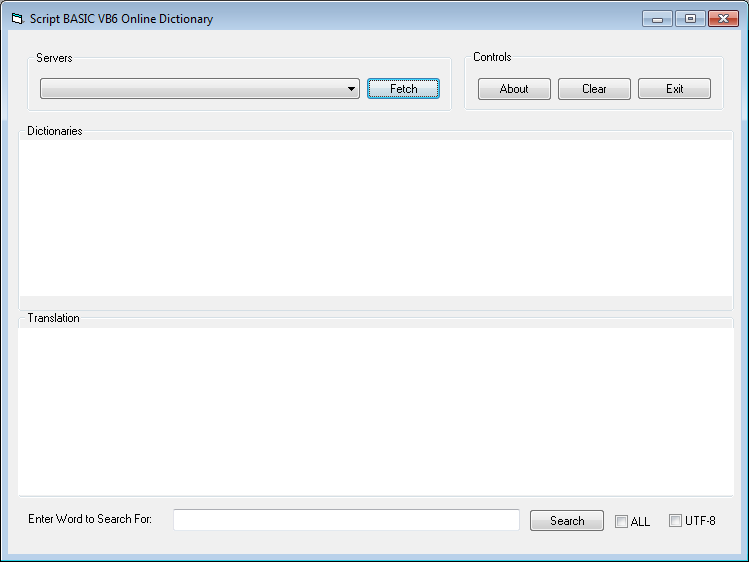 Here is how the Script BASIC COM interface browser sees the OCX DLL. 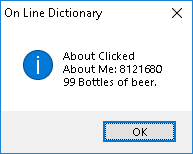 I've added resize ability to to On Line Dictionary form. The routines are simple to use and also handles resizing the fonts. Code updated in post #23. 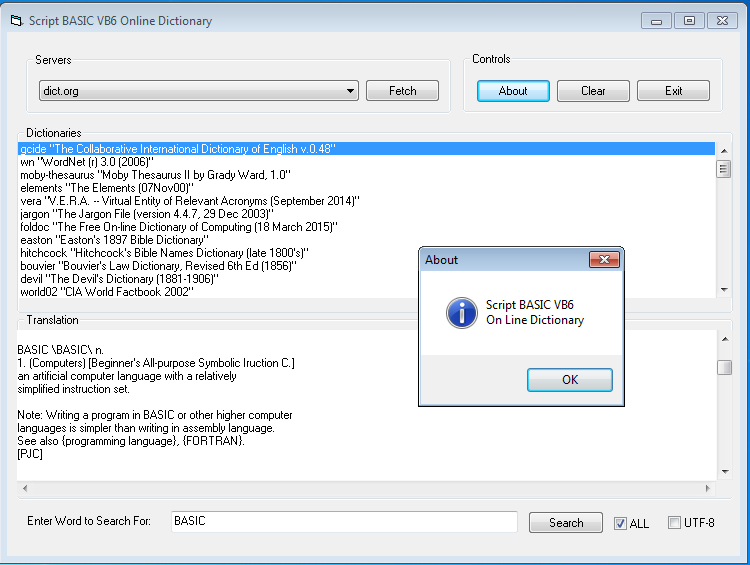 At this point, the VB6 based On Line Dictionary is functionally equivalent to the IUP version shown earlier in this thread. Other than not being cross platform, I like the VB6 direction more. I have provided my proof of concept of using an OCX control to provide an intelligent GUI as a COM object. I would be interested in how others feel about the concept and would you use it? Once I am back into development, I'll certainly take a long, hard look. It is certainly an area that interests me to no end. I'm trying to get Charles Pegge (Oxygen Basic author) to create a similar CallByName interface as what we have working with Script BASIC. It would be great to have a BASIC compiler support OCX forms (created with VB Classic or VB.NET) as well as having an interpretive solution. I never did get a response to what BASIC languages support COM/OLE automation.